Just as mysterious as the band name is the music of Essenz, a trio which has founded in Berlin in 2007. Two years after the debut with unpronounceable title KVIITIIVZ – Beschwörung des Unaussprechlichen, they are back with its successor Mundus Numen which once again has a weird title. The very idiosyncratic mix of sludge, doom and black metal has a definite avant-garde edge, and I guess this is the kind of music that you either love or hate, without any middle ground in between. The album consists of only six tracks which are all quite long, up to fourteen minutes! Right on the opener Extinguish Shapes: Innermediate, the importance of low tuned instruments is emphasised. The song is creeping slowly along, and the hardly audible spoken vocals have an eerie quality. Contrasting with this rather quiet beginning, the listener is rudely awakened by the following Sea Of Light: Pleroma. Black metal can hardly sound any more hectic and violent. The vocals are still rather sparse, but the growls match the music perfectly. A first highlight comes with the ten minute long Extricate Spirits: Amor, whose atmosphere would fit right into a damp crypt. The song is building on itself in a staggering way until it abruptly ends in cacophony. Observed By Spectres: Paranoia is a sluggish kind of doom with enthralling drones and poignant rhythms that will bury themselves deep within your mind. The fifth track To The Bone: Mania is not a regular song, but rather a succession of feedbacks that create a sonic nightmare that would be an ideal soundtrack for a horror movie. The album ends majestically with the nearly quarter hour long Observing Spectres: Schizophrenia, full of intense mood changes that may be occasionally quite crass but eventually always manage to flow seamlessly into the next movement. You have to savour each and every single note to get the most out of this unique listening experience. 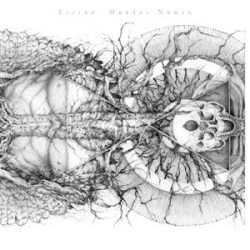 Mundus Numen is quite a special album. Essenz definitely know what they want, and you can’t accuse them of simply and blindly copying something else. This is an incredibly fascinating album. You only need to bring enough time and attention to be able to get everything out of it. And even though the music is very gloomy, it still is a good soundtrack for the summer of 2012 which hasn’t spoiled us with much heat and sun yet.